Roasted red grapes – simply a handful of ingredients and a quick blast of hot oven – are one very lovely and very delicious such way. I found this dish on my mother’s island of Evvia. In front of me at lunch was a steaming platter of rice pilaf topped with this huge, gorgeous, bright pink and purple mound of sticky sweet savory red grapes. I was mesmerized! Around me people started, quickly so as not to be noticed, picking off a roasted grape or two from the platter. Our host stirred them into the pilaf right before serving and the entire platter was gone in a flash! Want to know what you’ll need? Grapes, coarse black pepper, brandy, olive oil, sea salt, thyme – oh, and a sheet pan. That’s it! I prefer to use red grapes myself but you can certainly use green. I’m partial to bright pink so red grapes are my go to. Remember in the US to look for organic grapes whenever possible as you’re going to be eating the grapes skins. And a regular cooking brandy will do here, no need to use up your good stuff! It really does intensify the flavors though so remember to include it. 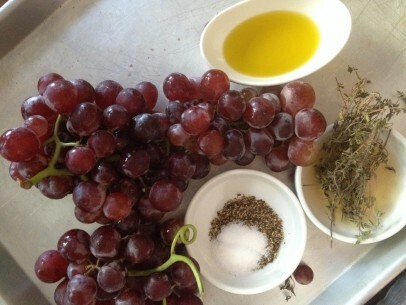 Mix all your ingredients, except for the grapes, together in a large bowl. If you do it the opposite way ,adding your grapes first and then each ingredients separately on top of them, you won’t be able to equally distribute all the flavors. 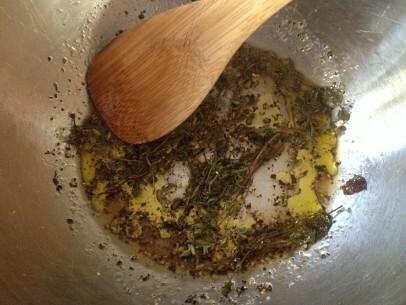 And get your thyme stalks right in there so they get a good coating of oil as well. Add your grapes and gently stir to coat all grapes completely. You can keep small bunches of grapes intact if you like or use all separate grapes. I’ve used a combination below. It’s totally possible to coat all grapes in a small bunch if you are careful and GENTLE. The only difference is in the presentation of the final dish. Feel free to experiment! 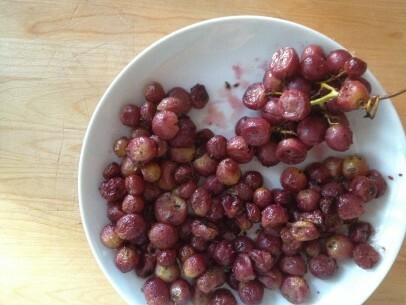 Turn out your coated grapes onto a sheet pan and arrange in a single layer. For small bunches of grapes, just sit them up a little away from the single grapes if you’re combining the two types on one pan. Try to get a bit of space between your single grapes but don’t waste a ton of time arranging them. Give the pan a good shake and that should do it. I like to roast my grapes at a higher heat for less time. This method allows the grapes to roast all the way through but still keep most of their skins intact. 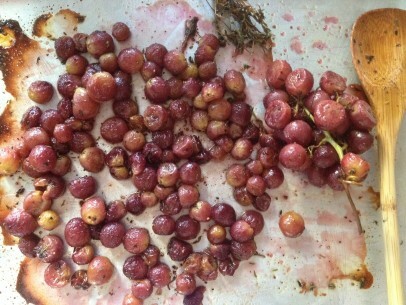 The longer roasting time at lower temperatures leaves the majority of your grapes burst open. Not that this changes the taste any, more of an aesthetic thing really. High heat for too long will give you tiny little raisins – not what we’re going for here! Scoop roasted, cooled grapes gently out of the sheet pan and into a bowl or on top of a steaming platter of rice pilaf, my favorite way to enjoy them! These will last in the refrigerator, covered, for 2-3 days and are great to add to salads for lunch. Combine all ingredients except for grapes in a large bowl. Mix to combine well and add grapes. Mix gently to coat all grapes completely. 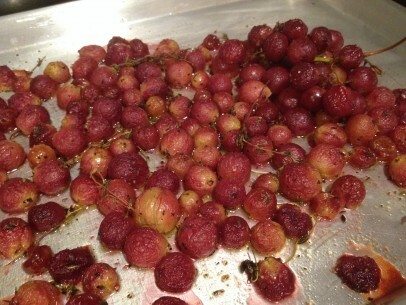 Turn out coated grapes onto a sheet pan and roast in 450 degree over for 20 minutes. Remove all thyme stalks. Allow to cool and gently scoop out of pan. Pile on top of a platter of rice pilaf or add to salads. You can always enjoy a big bowl of them all on their own too! delicious to enjoy as a snack all on their own! Thanks for the recipe. Very unique dish. We get the same American grapes here in India and so, I can definitely try this. I have never seen roasted grapes before but WOW they look amazing! Will have to try it when grapes come back into season here in Australia…my mouth is watering already lol. I make so many of your recipes and I’ve loved them all. And I never have to worry about it the quantities are correct etc as everything always turns out well. I’ve finally got round to leaving you some feedback. 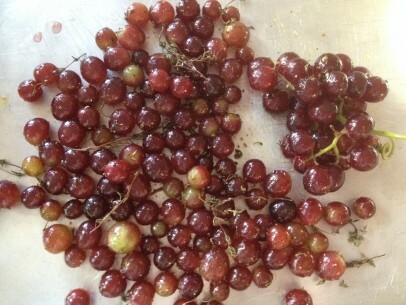 Today I made your rice pilaf dish with these roasted grapes. I can’t say how wonderful this food was. We’ve just got back from holidays and Greece and I lived there for many years and your recipes make me feel like I’m back there. The roasted grapes were surprising but delicious. I’ll be making them again very soon . Thanks for all these wonderful recipes and being my go-to for Greek cooking.